Officials in Bellevue say that two plumbers working on a reconstruction project suffered extensive burn injuries when a gas line exploded Thursday morning. 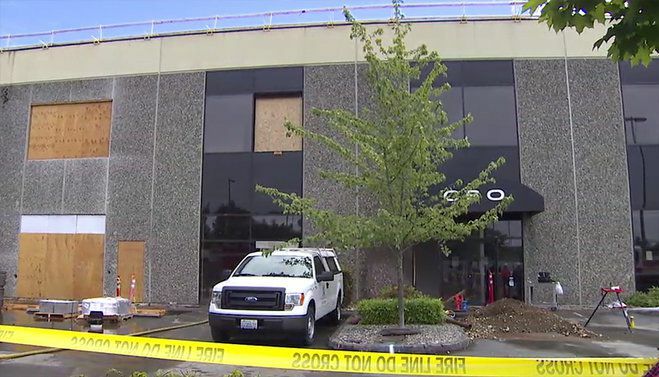 According to the Bellevue Fire Department, there was a “large diameter” explosion just after 9:45 a.m. Thursday as a plumbing crew worked on a reconstruction project at a Bellevue business park. Fire officials say the plumbers were not aware that the gas line was live when they dug a hole to work on the system. Two men, a 45-year-old and 36-year-old, were significantly injured and taken to Harborview Medical Center in Seattle for treatment of their injuries. Officials said the 45-year-old man was in satisfactory condition at Harborview, while the 36-year-old man was listed in serious condition and was likely to be moved to the hospital’s intensive care unit. “It’s just one of those unfortunate things that a line was missed and this happened here today,” said Lt. Rich Burke with the Bellevue Fire Department. Luckily, the flames triggered a sprinkler system on the side of a nearby brick building which eventually helped contain the fire and minimize damage. Burke added that the building likely would have been completely destroyed had it been made of wood instead of brick. Since the article identified the injured victims as plumbers, it can be presumed that this accident likely occurred while the men were on the job. Pursuing a personal injury claim for a workplace accident can be difficult depending upon a number of different factors. The men reportedly worked for MacDonald-Miller Facility Solutions of Seattle. If the company was contracted to perform work for the city or another government agency, the victims would likely be able to pursue a claim against the government agency responsible for ensuring a safe worksite. If they were solely performing work for MacDonald-Miller, then they may only be allowed to pursue an L&I claim, which significantly alters their legal options. Anyone who is injured in an accident that may have several entities involved would likely benefit from consulting with an experienced personal injury attorney with experience handling burn injury claims. Davis Law Group, like many personal injury law firms, offers a no-obligation case evaluation to all accident victims to discuss the legal rights and options of everyone involved. As a prior Compliance Officer for L&I, as well as an Expert Witness, I can see there are several twists to this story than can either benefit the injured workers, or as it states here, allow only for a workman's compensation claim. L&I benefits have set limits and benefit ending periods, (usually 1 year), but these workers may feel the pain or have a life altering ailment that will last long after the compensation claim is closed by the State. Who was responsible for locating the gas line? Was it clearly marked? Who gave the workers the duty instructions? Was there a pre-task plan? Not knowing the extent of the work to be done on site I am only assuming they were employees of a sub-contractor, in which case it matters to determine the amount of control and direction enforced by the General Contractor. Was there a site safety officer on site? Earlier Stute decision determined that general contractors can be liable and responsible for the actions of all sub contractors. There is another more recent decision also...but I can't think of what it is called at this moment. I could probably go on and on about cases like this. I hope they do seek legal council and not feel intimidated by their employer and afraid to ask for help.